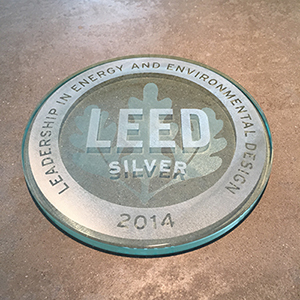 The Screen Porch Studio office is located in a LEED Silver building constructed in 2013, completing official certification in 2014. A commitment to sustainable practices and green building are a key aspect to our founder’s life. Adam has been involved with the United States Green Building Council for close to 10 years, culminating in 2013 when two exciting projects were completed. First was a new LEED Certified home for Adam and his wife with Adam serving as LEED AP Homes and the other was the New Regional Hospital in Augusta, Maine with Adam as Owner’s representative for LEED Certification on the largest green building ever built in Maine, now known as the Alfond Center for Health. This personal and professional passion includes Adam being a LEED Accredited Professional while both attending and speaking at sustainability-focused events, along with hosting a green building open house every year since his LEED Certified home was completed.